Reboot is equipped with a single sideband (SSB) radio. This gives me the capability of talking much longer distances than the marine VHF (very high frequency) radio. Since I live on “cruisers hours”; to bed when it gets dark, up at dawn, I have gotten into the habit of turning on the SSB radio as the sun comes up. The SSB radio depends on ionization of the atmosphere for long distance communications. At sunrise and sunset (the grey band) one can sometimes get amazing distances even though in general the lack of sunspots (think ionization again) has made long distance communication difficult for the past several years. This morning without much effort I talked to a ham in Uzbekistan and two hams in the Russian Federation. That is a distance of about 6,500 miles. Not bad! The seas laid down today and the winds moderated so it was a good project day. I started the day continuing to hook up the solar panels in test mode. By the end of the day I had one panel sitting on the deck generating about 4 amps of current. Considering that it was later afternoon and the sun was behind clouds this was not a bad outcome. I have moved the panel so that it catches the morning light so we will see how that goes. I also made some progress on reconfiguring the house and starting battery setup. Ultimately the 4D I use as a starting battery will become part of the house bank and a new 800 MCA starting battery will provide the power to start the engine. They will be hooked with an automatic charging relay so that when the engine comes on the house batteries will charge without me having to throw any switched. Then it became VHF radio play time as Capbam, Gypsysails and I learned how to use the Digital Selective Calling (DSC) features of the radio. This was motivated by the fact that I was woken up last night by a DSC distress call on my radio. Apparently it was a false alarm but the sound of the radio blaring its distress call alarm really made me pay attention. It is interesting how priorities change. We have been anchored for several days in a row. One of my three water tanks just went dry. I have a water maker aboard but it is not yet commissioned. It is definitely now on the priority list for before I leave for the Bahamas. In the meantime my choices are to bring water in jerry cans from shore or do a 15 mile round trip to a marina that has water at $0.35 per gallon. Water from shore, although a lot of work, will win out. I received a call today from Steve, an old Navy buddy (actually, my Commanding Officer three times!) It looks like he will be coming down to spend some time on Reboot. I have not seen him in person for years, it will be a great reunion. Sunday is a big cruise ship day. There were five of them in "Government Cut", the main Miami channel when we left this morning. That meant, of course, that we could not use the channel. I guess it is a 9/11 thing. So we used the alternative channel and headed out to sea. As an aside, cruise ships have certainly changed a great deal in the many years since I have been on board, Most people are aware that they now have many more staterooms than before. But what about the large screen TV, the size of a baseball scoreboard, on the top deck. Not only that, but the old fashioned "we are getting underway" and lifeboat drill has been replaced with a full scale disco blaring almost as loud as the ship's whistle to the accompaniment of a woman screaming to the crowd to "get it on." Quality! I have been in a parade of boats today, but I have yet to see any but Capbam and Gypsysails. A group of 5 other sailboats left Miami Beach this morning and is headed for the same anchorage at Rodriquez Key. I have seen a couple of their sails in the distance. I am still 3 miles from destination, so I expect to see them soon. Up this morning at 6 AM to get underway at 7 AM. The anchorage had 7 cruising boats. I expected to be one of the very few up this early but by the time I housed the anchor at 6:55 AM every other boat was either finishing up or already underway. I presume we are all headed for Marathon, FL. It is about a 40 mile trip. In a sailboat in the middle of winter 40 miles is a good day trip. (BTW today is the winter solstice, the daytime will start getting longer again tomorrow.) As I write this we are strung out in a line about 3 nm long all follwing the "magenta line" which marks the Hawk Channel on our charts. I am slowing starting to understand how to sail Reboot out here in the ocean. The sail configuration for Lake Michigan provides far too much drive out here. I am currently sailing with the wind on the beam, waves at 2 to 3 feet. I have the jib furled to 105% and no main up. I am doing 6.5 to 7.5 knots in 15 to 20 knots of apparent wind. I expect that my normal setup for coastal cruising will be a double reefed main and an 85% or 105% jib. I had the entire 155% jib out earlier and was seeing 9.5 knots. The problem with that is the autopilot does not do a good job of steering. So I hand steered for about 2 hours this morning. I enjoyed it, particularly rolling all the other sailboats that had left before me. Then I cranked the jib down to 105% and slowed down so I could take a break from steering. Since I single hand it is important to have a wide slot that the autopilot can steer in. If I really trim up the constant gusts drive it crazy. Reboot heads up, the autopilot reacts late, over steers, we drop off, etc. If I de-trim a little bit we slow down but it is a much smoother ride. We had two days of very heavy rain that moved north and blanked the East Coast with 2 to 3 feet of snow. The cold front that came in after the rain has dropped the temperatures a lot. At the moment it is 60 F. With the wind chill I spend a lot of time in my foulies. They do a great job of blocking the wind. In a couple of days it will go back up into the 80F range and I will be back in a bathing suit. When I used to sail with my family I spent almost all of my time in the cockpit. I was so worried that something would go wrong I would obsess. Now that I am alone I find myself moving around the boat a lot more. When the weather is cold like today I spend a good part of the time in the cabin. On the trip from St. Johns to Ft. Pierce a lot of stuff that I had stored around the salon table slid all over the place. I stowed it all. I had forgotten how nice it is to have a big open salon area. I have rafted up with other boats a couple of times and my salon is the indoor party location of choice. Party On! I am underway again in the Hawk Channel. The ICW crosses the keys at Marathon. It runs on the north side down to Marathon, and then runs on the south side to Key West. The Hawk Channel runs on the south side all the way from Miami. They are now essentially one in the same, but my charts again have the statute miles distances along the ICW from mile 0 in Norfolk VA. I have about 15 miles to go to my intended anchorage north of Sigsbee Island at Naval Air Station Key West. I had a great conversation with Spencer yesterday. He had finished his last final for his fall term of his junior year. He is definitely on the back side of the undergraduate experience, only three more terms to go. Today has been a mixed bag. I am loafing down the Hawk Channel. I am flying the full jib, the water is clear, the wind pleasant but a bit cool. This morning I left the company of Capbam and Gypsysails a bit before 7 AM as the wind had clocked Reboot around to where I could slip the mooring line and not get blown down on anyone. I noticed as I retraced my route out of the very large mooring field that the water seemed a little thin. Sure enough before I had even reached the bascule bridge Gypsysails announced that she was aground. Fortunately the tide was dead low and they floated off a bit later and followed me down the Hawk Channel. I find myself surprised at the number of emergency calls that we hear on a daily basis. In Lake Michigan an emergency call was rare and groundings were nonexistent. Here I hear between 3 and 6 calls per day from boaters in trouble. I am here, behind Sigsbee Island near the Sigsbee Marina for the Naval Air Station Key West. After 3,000ish miles, some sailing, some motoring (Erie Canal, ICW) and 4 ½ months I have arrived in time for Christmas. To be fair I spent a month in New York (Weehawken NJ) so I was only sailing and such for 3 ½ months. It is great to "check off" my first big destination. After taking advantage of the proximity of the marina to a West Marine and Publix we (Gypsysails and I) left our $90 per night marina slips and anchored south of Causeway Island to get ready for the next leg of the trip to Key West. I finally got to do something that I have wanted to do since Milwaukee – jump off the stern into warm water and swim. It was delightful, and weather permitting will be a frequent occurance. We took off from Ft. Pierce in south winds and beam seas. There was just enough veer that I was able to sheet in about 105% of the jib right against the spreader. This made for a much more comfortable ride. In addition to beating to windward we also had to cope with the Gulf Stream. It comes very close to shore on the Ft. Pierce to Miami coast. We spent most of the trip on the 50 foot depth curve. That meant we were about ½ mile off shore. There were two other sailboats paralleling our course but further out in the stream. We tired to raise them both on the VHF but only got an acknowledgement from one of them. At about sunset Capbam, the sailboat that had answered our call asked us our destination. We told them we intended to sail all night and get to Miami Beach in the morning. They had been planning to pull in but decided to join our happy little band and continue on. With adverse wind and current we finally arrived at about noon, several hours later than our projected arrival time and got to meet Cappy and Bam in person. The three boats traveled down “Government Cut”, hung a right, passed under the bridge, hung another right and headed for Miami Beach. We anchored opposite San Marco Island. The weather forecast was pretty ugly with wind from the South so we relocated the next morning between Watson Park and Palm Island. Little did I know that my trauma was about to begin. We took a dinghy ride into the Miami Yacht Club to arrange to have parts that were being shipped to us delivered to the Yacht Club so we could pick them up.. How hard could that be? Apparently “above the grade” of the staff of the Yacht Club. When two packages arrived they accepted one and refused the other because they did not know who it was for. Then they didn’t want to give us the first package because they thought it was for the Yacht Club. After several minutes of pointed out that it was addressed to Gyspysails rather than the Yacht Club they finally gave up the box. But of course we had to deal with Federal Express and get the second package redelivered with little hope that it would be accepted. It did arrive the next day and we did get it. Of course it was raining cats and dogs and blowing like stink. Cappy rented a car and we went to Sailorman. This is a very famous new and consignment boat store in Ft. Lauderdale. It was fun but I was not motivated to buy. We then shared a nice dinner in a local diner and headed back to the boats. Finally tonight the rain seems to have stopped. We took the dinghy into the Miami Yacht Club, swam in the pool, and got warm showers. Tomorrow the weather forecast is for strong winds. In addition, the wind shift means that the waves in the Atlantic will be nasty. So we are planning to depart on Sunday for Key West, a trip of about 120 miles. I will be in the company Capbam until Marathon. The final destination for Gypsysails, like me, is Sigsbee Island at the Naval Air Station Key West. I expect to also see other retired military that I met in Little Creek, Norfolk, and Jacksonville. Hopefully we will get some nice weather and have several days of easy and enjoyable sailing. Today we had three cruise ships in Government Cut. The Atlantic coastal forecast was nasty: strong winds, thunderstorms, high seas, etc. Did that stop the cruise ships? Of course not. They all left on schedule this evening. I wonder how the passengers are fairing. I got a chance to spend some time on the phone with both Trevor and Spencer. It’s final exam time for Spencer; he has one down and three to go. I can still remember (however vaguely) how much I hated that time. Leaving today from Ft. Pierce on the outside to South Beach and Miami. It will take about 24 hours. I will check back in when I arrive. I left Jacksonville in the company of Gypsysails and headed for Ft. Pierce. We went outside with a following strong wind and seas. We arrived at Ft. Pierce after dark and anchored just off the main channel in the inlet. Both Gypsy and I have to go back to “stow for sea” school, we had stuff sliding all over the cabins of both boats! First story: I could not get my anchor up to move the boat. 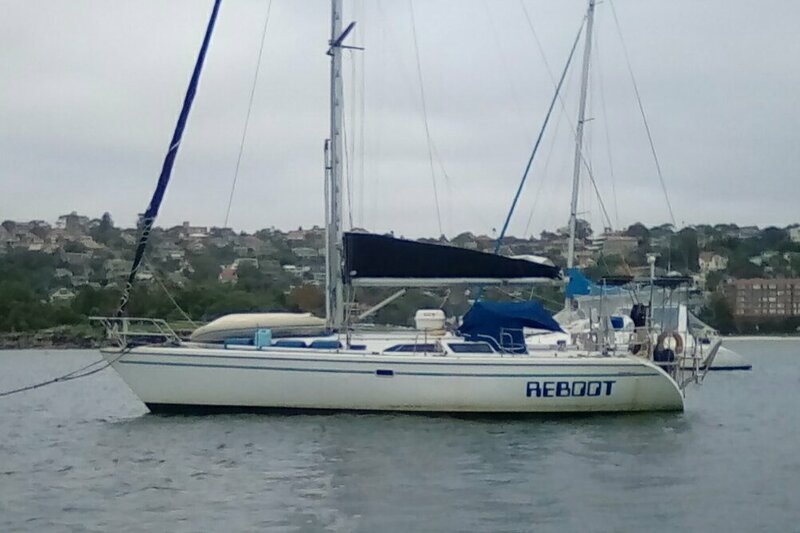 Reboot had sailed around the anchor chain during the night and wrapped the anchor rode around the keel. After several fruitless hours of waiting for the tide and wind to change I finally called Towboat US. (Thankfully I have Towboat insurance so it was covered.) It only took a couple of laps around Reboot by the towboat and then I was able to raise the anchor. Off I went to join Maury and Ginger at Harbortown Marina for the night. We decided to take a night in a marina so that we could go to the local West Marine and the food store. Both were a short walk. Interesting coincidence, after I called Towboat the local coast guard RIB stopped by and asked me if I was OK. I explained that the anchor rode was wrapped but that Towboat was on the way. They were very friendly but during the conversation Towboat arrived so they wished me good sailing and were on their way. The Towboat skipper told me that 90% of his calls were for the location I was in. Apparently the winds, currents, and tides tend to get a lot of boats wrapped around their anchor rodes. Second story: I wrote a few days ago about my wonderful experience at The Marina at Ortega Landing. Today I was brought back to earth. Harbortown charges the same slip fees as Ortega; since they are both in North Florida I consider them in the same market. But the amenities and experience are like night and day. First, the slips are serviced by narrow finger piers. They are so short that I am climbing over the bow of my boat to get on and off and so narrow I throw things off the bow to the dock rather than trying to carry them down the pier. Second, they did not have a slip with the proper power. Fortunately I had the ($250) adapter I needed to hook Reboot up. Power, of course, is an extra daily charge. Who goes into a marina and doesn’t plug in? Then of course there was the Internet. That is, of course, an extra charge. How about cable TV? Sure, but only the most basic cable – essentially the local broadcast stations and a couple of other channels. No pool, no hot tub. Credit however, where due, the dockhand was most helpful getting Reboot settled in. This will not be on my list of repeat marinas. Third story: Last night was the Christmas Parade of Boats. Each boat came down the inlet to the marina and passed by the fuel dock. The decorating on some of the boats was simply amazing. Some people had invested many hours in lights and music. It was great fun. Plans: After several days of North winds the wind has shifted to the South for the next few days. This would be great if I wanted to go to the Bahamas. Since I am headed for the Keys the wind is now in my face. This is not good for sailboats. I will most likely truck on down the Intracostal for a bit until I reach Miami. I have to go outside at that point since someone in their great wisdom built the Julia Tuttle Causeway Bridge at only 56 feet (fixed.) It is the only bridge with less then 65 foot clearance on the entire 1200 miles of the ICW. Does Julia Tuttle know that every ICW sailor curses her name? When I got Reboot she had a Raymarine ST-50 radar unit. This was a LCD black and white unit that I had previously had on the original Reboot, a Catalina 30 that had been built in the 1980's. Yesterday with the help of Maury of Gyspysails we got the new 18" Garmin HD radar dome mounted. We also moved the radar dome location from a pole on the stern to on the mast between the first and second spreaders. This should give us a lot more range for low lying targets. Today we are shifting locations again so I should have an opportunity to see how it works out on the water. As those of you who follow my blog know I tend to be on the cheap end of things. I anchor out rather than paying for an overnight slip. I find the free docks provided by municipalities for transient boaters. I frequent military marinas not only for the company of my fellow comrades-in-arms but also so I can use the commissary and post exchange. This weekend was a major change of pace. Gypsysails and Reboot left Jacksonville Landing where we had gone to wait out strong south winds and headed for the Ortega River and The Marina at Ortega Landing. 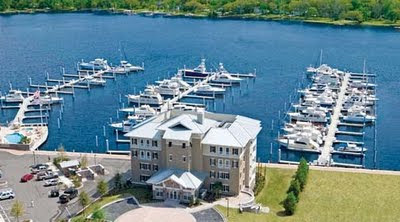 This is a very beautiful high end condominium complex and a beautiful high service level marina. It is the first facility on the north side of the Ortega River just beyond the Ortega River bridge. The pampering started even before we arrived. Rather than the normal procedure of calling a marina several times in order to get them to respond they called me as I was clearing the bridge! Again, instead of the normal "count this many docks and then turn and count ..." the instructions were clear - "Do you see the dock hand in the yellow slicker?" "Yes." Like an airplane coming into the terminal there was a dock hand at each spot directing us into our slips. Backing an 11 ton (Gypsysails is 24 tons) sailboat into a slip is alway an adventure. With three knowledgeable dock hands handing our lines it was a non-event. The facility itself is modern, beautiful, and immaculately kept. It boasts clean modern rest rooms, a free laundry room, free ice and a helpful and a knowledgeable staff. There is a swimming pool that we have not been able to use due to rain and very cold temperatures. A real treat for me is the cable TV hookups, I have not had cable either in my old apartment or Reboot for over a year and a half. There is a modern mall which has a West Marine store and a large variety of other stores a short walk away. All in all a great place to stop to visit Jacksonville FL and the surrounding area. Now if we could just get some of the Florida sunshine! Reboot and I are back at Jacksonville Landing waiting out strong South winds and rain. Today we were just hanging out waiting for the weather so I decided to invite the other boats at the dock to a Cruisers' lunch. We had Maury from Gypsysails, Connie and Bob from Meredith, and Don and Betty from Ram-sea. 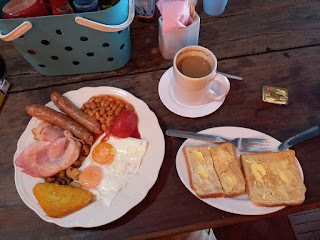 I picked "The American Cafe" here at The Landing as the meeting place. We got there only to find that half of their kitchen was not working - they were having gas problems. Of course as cruisers we are all used of something not working on our boats so we made do with what they could prepare. In fact, that was quite a bit of their menu and I think we all had a good time.